The Resident Student Association (RSA) functions as the governing student body for our residence halls. RSA is the second largest student organization on campus. Each student living in a residence hall is already a member of RSA. Residence hall students are welcome to further their commitment to our community as Hall Council members! Beyond serving as the direct liaison between the residents of our halls and University administration, RSA plans amazing events throughout the year, and offers philanthropic opportunities. Click here to learn more about RSA. The National Residence Hall Honorary (NRHH) is a nationally affiliated organization that serves to recognize outstanding residence hall leaders on affiliated campuses.NRHH has four focuses (called “pillars”): service, leadership, scholastics, and recognition. Pitt’s Jonas Salk Chapter of NRHH caps membership to the top 1% of the total campus population. Each semester, the NRHH executive board accepts applications for membership; successful applicants attend induction ceremonies in the spring semester. Click here to learn more about NRHH. RAs are some of the most important people on staff here at the University. They are students, just like you, who have committed themselves to one of the most impressive leadership positions on campus. RAs live on your floor and are there to serve as resources for you and your floor community. In addition, your RA will help you get involved in programs and activities both on your floor and throughout campus. RAs can provide you with information and resources about succeeding both inside and outside the classroom, so take advantage of their knowledge and experience! Click here to learn more about how to become a RA. So, you want to become a Resident Assistant? Great! Becoming an RA is a great way to get involved on campus and make a difference in the lives of your fellow students. On this page you will find all of the information you need if you'd like to apply to become a Resident Assistant. 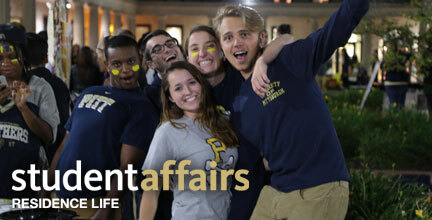 When you submit your completed application to the Residence Life office, our staff will review your application*. After our initial review of your application, we will invite qualified candidates to participate in our Group Process Session. *Please note that all RA Applicants must have a minimum 2.5 GPA (both cumulative and most recent term). Early in the Spring semester we will hold multiple 'Group Process' sessions, during which candidates will participate in small group sessions focused on problem solving. The dates, times, and locations of these sessions will be announced later. Select candidates will be invited to participate in an individual interview with a Residence Life staff member after we review the results of the Group Process. After both the Group Process and Interview pieces, a select number of the remaining candidates will be invited to our RD Networking Event. There, candidates will interact with current Resident Directors. Finally, we will extend offers to candidates for RA positions. We will also extend offers for our "Eligible for Hire" pool. Eligible for Hire status means that you are in our process as an alternate. Every year, we go to this pool to fill additional openings as they arise. Check out our timeline to make sure you are following all the necessary steps to complete your application! During the last five weeks of the Spring Semester, candidates who have been offered a definite RA position and candidates in our Eligible for Hire pool will participate in weekly training workshops that cover everything you'll need to know as a Resident Assistant. For more information about becoming a Resident Assistant, contact us.